I occasionally write for The Guardian, I often work for the NHS. Desperately striving for an objective view of reality is a technique to reduce anxiety-provoking uncertainty. It promises itself as a way to stop a descent into madness, to avoid being completely disorientated in a nonsensical confusion. Belief is by its very nature a personal phenomenon, I cannot objectively hold a belief, it is a subjective experience. There can be objective evidence that proves or disproves my belief, or there can be objective evidence or reasoning that points to my belief being highly unlikely, therefore objectively the belief can be false. The definition of the word delusional shows its idiosyncratic, personal nature. Take this alongside its synonyms which point to something incorrect, an error, a falsehood and it would be easy to define a delusion as a false belief. But as the very nature of a belief is subjective this tells me exceptionally little about the belief, the experience of having it or the person who holds it. A child at Christmas thinks Father Christmas has come and delivered her presents, but as adults we know this is false, a delusion, does this then mean that we reject the experience of opening presents on Christmas morning for the child and call it all nonsense? If we are trying to engage with the child it would be interesting to wonder what it means for the child to think that an old fat man she has never met has deemed her to be not naughty but nice enough to therefore (hopefully) recieve presents she will like and enjoy? How about if her brother gets more than her and she doesn’t receive her most wanted gift this year? The answers to these questions open us up to the rich, complicated, idiosyncratic narrative of the child that would be completely missed if we had dismissed her belief in Father Christmas as a false delusion. When we read about psychosis or delusions we come across phrases such as “removed from reality”, “strong conviction despite superior evidence”, “abnormality of thought”. This discourse provides a story about a superior viewpoint on reality, a truth about the world that you either share or you don’t, and if you don’t you are Other, you are separate and not in a good way, in an abnormal and deviant way. This discourse only serves to alienate and coerce. It creates an atmosphere of hopelessness and fear around a person who is probably suffering enough already. Nothing new is being said here! Deleuze & Guattari in Anti-Oedipus famously said “A schizophrenic out for a walk is a better model than a neurotic lying on the analyst’s couch. A breath of fresh air, a relationship with the outside world”. Laing, Foucault, etc have been encouraging people to see delusions or unusual experiences as something more than a false belief and always as a product of something else (even though they disagree about what that something else may be, Marxist critique’s of capitalism aside) for decades. However, these themes rarely appear in mainstream “mental health” culture, both inside and out of the clinic. It takes a programme like BBC Horizons “Why did I go mad?” for people to even start to question whether the narrative is starting to change. Why do we cling to such simplistic views about truth or falsehood? Why is it counter-intuitive to go with the belief itself rather than try to provide evidence to the contrary? CBT uses this technique to look at evidence “for” and “against” beliefs and while this may be effective for some people there is another way. Desperately striving for an objective view of reality is a technique to reduce uncertainty, it promises itself as a way to stop a descent into madness, to avoid being completely disorientated in a nonsensical confusion. Which in part it achieves, it has a function and a role to play. Yet the downsides to this approach are clear; the human suffering caused by this obsessive rejection of subjectivity should not be ignored just because doing the opposite has an advantage too. What would happen if we were more able to bear the anxiety of not knowing? If we were willing to risk feeling disoriented by trying to put ourselves in the position of the person experiencing the ‘false belief’ and join in the descent into madness, however bewildering that may feel at times? When we try to empathise, when we curiously ask about those valid, subjective narratives. When we try to engage in a non-judgemental, accepting way towards experiences of psychosis/delusions/unusual beliefs instead of focusing on the flawed logic that objectively the belief is false, we are dramatically increasing the chances of helping someone. To feel heard, to feel accepted, to have value, and to belong somewhere. How do past events increase our suffering? Without owning a TARDIS how could we improve the present by changing the past? Lacan is working with Buddhist and Quantum theory here to put forward the argument that there is no past (or future) all we have is now. The ‘past’ is in the present as we re-work, recall and discuss it in the present. An objective history is nowhere to be found. Twenty people can be involved in the same car accident and all have different opinions and memories about it. They will all attribute different meanings to the same event. So what would a reintegration of a subjective history look like? Reintegration brings to mind a restoration or re-working, an improving-upon. Replacing one meaning for another, returning back to an event to construct a new meaning. At school sports day you hear just before a race from an older child “If you can’t win a kids race you cant do anything”, you then finish near to last. There can be an assimilation of this belief into one’s life, sometimes we will remember it, other times not. Often we don’t question the event or the meaning we have given it. Perhaps we feel a sense of shame, it adds to the lingering sense of failure that pervades our lives . We are perceiving this particular piece of our history together with the meaning we gave to the event at that time. It is of no importance that one remembers “exactly what happened” or “the truth of the matter”, Lacan is saying that what matters is what one makes of these events, what meaning is attributed to them and how we go about reconstructing this meaning and reintegrating ourselves into our subjective history. Psychoanalysis can be a place to explore these memories, the meaning we have given to events, to reconstruct this history and to question our past – did I really fail? does this failure mean I am doomed to not achieve anything in the future? If we are given the time and space to question our past we open the door to create new meaning. Enjoyment of pain is still taboo. Rarely do we hear about what is satisfying about depression, eating disorders, anxiety, etc. Conversations about mental health have only recently become an acceptable topic, we can’t start talking about how we sometimes enjoy our symptoms can we. Yet at times there is a perverse enjoyment in suffering, an enjoyment that if recognised can be used to transform the suffering itself. What is this satisfaction in dissatisfaction? Note “little”, there is not an argument to be made that people love being mentally ill and feeling anxiety is great, etc. Worry/obsessions and compulsions are known ways for people to cope with the impact of trauma. OCD takes up a lot of time, effort and thinking space, it’s an excellent way to avoid the more distressing memories of traumatic events. Avoidance strategies, while distressing in themselves are often preferable to experiencing what is being covered up. If I’m terrified of going outside then the impact on my life of staying indoors may not be enough to force me out of the door to face my fears. Eating disorders can create a sense of control, they can also be used as a way to appear fragile and in need of care. If a child doesn’t experience care and comfort then as an adult they may go about finding this care in a round-a-bout way. In our individualistic culture where self-sufficiency and independence are praised, asking to be looked after is often a shameful thing to want, let alone ask for. Whereas if you’re painfully thin you are showing your pain to the world in quite a socially acceptable way. So what happens when therapy attempts to take away these symptoms, often from someone who is vehemently declaring they want to get rid of them? Clinicians often talk about being people not being ready to change, or not being motivated to engage in therapy. Why would you want to work hard to let go of something that is working for you on some level? If we want to transform the way we suffer asking ‘what is this doing for me?’ is a good start. The more time we spend complaining about how terrible everything is without recognising our investment in our symptoms the less chance we have of breaking free of them. The human sciences have provided a discourse of normal vs abnormal to discuss our inner worlds. This discourse has created a pathological approach to subjectivity by influencing us towards a medicalised view of the human condition. It proclaims that at the root of human suffering are psychological problems that are treatable, either by therapy, medication or self-help techniques. The belief that there is an objective measure of “normal” that we should all be achieving fundamentally encapsulates what it means to be a human in the 21st century. There is very little space outside of this normal/abnormal dichotomy for a human trait or behaviour that isn’t ubiquitous. We are able to discuss emotions and thoughts with an ease not afforded to older generations. Campaigns to reduce mental health stigma have had a significant impact on how we discuss subjectivity. Our new-found ability to talk about suffering is a positive change, unfortunately this change coincides with pathologising language. The influence of this medicalised discourse can be seen in our use of words like ‘crazy’,’unhinged’ and ‘mental health’, it seems to suppress the subtle nuances of trying to put into words what it is to be human and replaces it with the term “it’s a severe mental illness”. We can talk about personal growth and empowerment, about being inspired and fulfilled. There is a belief that we could all undertake some sort of journey to achieve the ultimate goal of normality. A normality where worry and anxiety don’t really exist, a normality where we are able to work and enjoy, within a vacuum, fitting in and being self-reliant. We seek masters to tell us what to do and how to do it. Treatments and techniques to rid us of our problems. One of the things that appeals about Lacanian diagnostics is the complete absence of a ‘normal’ clinical structure, there is no position of ‘mental health’. With Lacan you are either psychotic, neurotic or perverse. Any ideas of cohesive, sane, rational people are phantasms, as all subjects are split subjects. We lack. Contrary to most ego-centric ideas there is no solid self to be found underlying everything and ‘running the show’, if we just keep looking, we won’t find it. We are alienated by language, within inter-subjectivity we can have beliefs about ourselves, a conscious ego, but that is not a cohesive subject, it is not a Cartesian subject. Apparently there is nothing romantic about mental illness. Which is odd because the internet is awash with dark pictures depicting distress and impassioned quotes. Tumblr especially has a large collection of pro-self harm and thinspiration imagery. Does finding beauty in pain make it more acceptable? What is the function of strongly identifying with being depressed, mad or terrified? A culture that admires and reveres mental illness has developed over the last decade on social media and like most sub-cultures it exists on a spectrum. On the severe end self harm is encouraged and eating disorders are idolised within a culture of competition. To take your own life is a way of becoming forever recognised as a suffering being. What does denying the romanticism that some people see in suffering do to the debate around ‘glamorising mental illness’? This feels rather simplistic and patronising and appears to be missing the crucial point; that some people find meaning and validation in suffering. As a society we are often told to ‘man up’ or’get on with it’. Not functioning well enough in a career or in a relationship is often judged as weak. From a young age children can be told ‘don’t cry, you don’t need to be upset’. Does this lack of validation about the suffering we experience, both from within the family and within wider culture encourage some to create emotionally-charged material that is popular with others? Perhaps if someone is feeling stigmatised then romanticising what they are experiencing makes it more bearable. Glamorising pain obviously has a downside, it can encourage vulnerable people to sink into further troubles and take up coping mechanisms like self harm that are often not advantageous. But to intervene and have a conversation about this we need to recognise the reasons behind the allure and fascination of suffering. In my last post I touched on the 1 in 4 statistic, so often used when discussing mental health. Like most mickey-mouse statistics it is catchy and easily understood, it’s been used globally by the NHS, mental health charities, anti-stigma campaigns and the WHO to name but a few. This widespread use has entered the phase into mainstream discourse. What are the implications of this? Its worth stating that there is no solid data behind the one in four statistic. I wont go into criticising the study the statistic is based on, for more details see here. The reality is there has never been a longitudinal study into any rates of mental illness or subjective states of suffering. The WHO attempted it, but the results came out as nearly 1 in 2. Regardless of the validity of any statistic we should not need to rely on catchy phrases to reduce stigma about mental illness. 1 in 4 attempts to “normalise” and reduce stigma by putting forward the idea that a quarter of us will suffer from a mental health problem, therefore as it is such a large proportion of the population it must be half-way acceptable mustn’t it? and actually 25% of us are not shouting at trees with tin foil hats on are we? Unfortunately this partitioning off of a quarter of the population just continues to generate and advance the very stigma that the statistic is trying to diminish. 1 in 4 puts forward that if a quarter of us suffer from mental illness, then mental illness is common and if mental illness is common then it is nothing to be ashamed of, but this just reinforces the view that if something is “abnormal” then it is shameful. If it was 1 in 40,000 it would still be unfair and immoral to discriminate. We can see this discrimination occurring in response to rarer and less understood diagnoses. Most people will have experienced some sort of anxiety or felt down at points, talking about depression and anxiety is much more acceptable than disclosing schizophrenia or a personality disorder. I wonder whether shame is more apparent in people who have been diagnosed with more “severe and enduring” disorders. 1 in 4 also serves to downplay the terrible suffering that some people experience. 1 in 4 implies that it isn’t such a major deal, lots of people encounter it and get by just fine. This undermines the seriousness of the distress and pain people endure on a daily basis and the consequences of this. 800,000 to 1 million people die as a result of suicide every year. Lets have compassion for everyone that suffers and not just because it is “normal” or common. What does a hole in your chest have to do with attachment? Psychoanalysis has attempted to put forward answers to this particular question for decades. The contemporary psychoanalytic attachment theories of Paul Verhaeghe and Peter Fonagy throw up interesting perspectives, but to discuss this one has to touch on the pioneering literature on attachment. Take Balint’s ‘basic fault’, this describes an experience felt by some that something universal and essential is missing inside. He theorises that it stems from a ‘failure of fit’ between a babies needs and the primary caregivers responsivity to these cues (crying, smiling, yawning, etc). Winnicott and Balint both stress the importance of a holding environment (a secure, safe and loving environment where emotions can be safely expressed in a reliable and trustworthy relationship) without which there may be an experience of an internal/external black hole. We know that around 60% of people have a secure attachment style. Does that mean 40% of us are walking around with a painfully empty chasm in our chest, feeling not quite ‘real’ inside and desperately trying to fill our lack? Or is this phenomena to a lesser extent an intrinsic part of being a human subject? What does CBT have to say about emotions? I’ve spent the day at Christine Padesky’s conference in London. 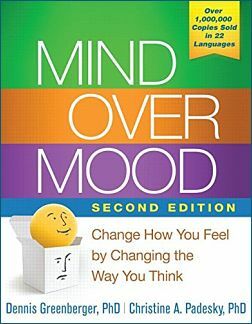 An expert in her field, Aaron Becks Californian-based prodigy pretty much wrote the book on CBT. Listening to her today reminded me of what always fails to surprise me about CBT; the almost complete denial of past events and how they may be contributing to someone’s symptoms. CBT will work with what it calls core beliefs in longer term therapy, however as CBT is generally offered short term (especially in the NHS) the majority of the work is based on intervening at the level of the presenting symptoms, such as lack of activity, negative thoughts, etc. I have written about the efficacy of CBT elsewhere. It is sufficient to say that there is no one size fits all approach to distress and a lot of people have greatly benefited from a practical skills based approach to therapy. Attempting to answer the question posed by this post is a difficult one, the answer appears to be “not much”. Today we were given examples of current stressful events in a case study, these were cited as “environmental” causes or triggers for the emotion that was being experienced. The focus was primarily on what changes needed to be made by either changing negative thoughts or targeting behaviour that may be maintaining the particular emotion that the person has come into therapy for. I wonder if CBT is doing itself (and the people who have no choice other than to accept it) a disservice by substantially ignoring the individual and collective causes that lead people to suffer in the first place. Is suffering our natural state as subjects? Or has the cultural influences of psychiatry given a lot of us identities as disordered? Cultural attitudes are shifting, it is much more acceptable now to discuss the fact that we suffer. But what has stigma and repression since time immemorial done to the mainstream discourse and thought about our internal worlds? Freud spoke about transforming neurotic misery into common unhappiness. His language is obviously of its time, but are we as a society disavowing this and taking ourselves on a fool’s errand to look for a cure-all to the “Global crisis of depression?” (WHO).